Killing fleas in your yard is essential to general flea control. Understanding the flea life cycle allows you to effectively recognize and kill fleas in their different cycles. If fleas are not taken care of around the outside of your home, you will inevitably bring the pests indoors. There are some very simple things you can do to kill fleas in your yard. There are a few plants that fleas just don’t care for and will help with your outdoor flea control and prevention. and are very easy to add into your outdoor landscaping. Mint is easy to grow, in fact they can overgrow very easily, you will need to trim them back from areas you don’t want them. Along with being a great flea repellent outdoors, you can use the leaves from the mint plants indoors for flea control as well. Put the leaves under you couch cushions, under furniture anywhere fleas could hide that you don’t think you will be able to reach any other way. 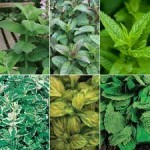 Mint is a perennial and grows wonderfully in direct full sunlight and they like dry soil. in your yard and offer a wonderful smell as well. You can either grow the tree right in your backyard or you can grow them in pots like the picture to your right. This is a fast growing tree and it doesn’t like climates with temperatures below freezing. If you live in a climate that does go below freezing then having them in post is ideal because you can bring them indoors if the temperatures are to cold. 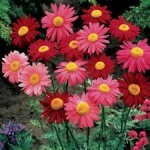 and is a member of the chrysanthemum family. These are very hearty beautiful flowers that can add outdoor flea control along with beauty to your landscaping. These flowers like full sun and are often used for outdoor pest control by landscaping professionals. If you put these beautiful flowers along dirt paths and walkways you will find them to be a very good flea preventative measure. 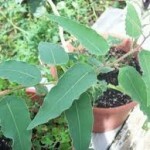 These are just a few plants that are wonderful for a natural flea repellent in your yards. You may also want to consider Pyrethrums, lavender and rosemary. Not only are they very fragrant but you can’t beat the natural flea prevention in your yards. You may want to consider a chemical to kill fleas from your yard along with the plants and flowers. Visit outdoor flea removal in 4 simple steps, to find step by step instructions to remove the fleas and it’s life stages outdoors. You can also introduce natural flea predators to your yards natural environment, visit fleas natural predators what is it?, for more information with this.